According to SHA maps, state maintenance ends near the Hagerstown city line. Becomes North Potomac St. in Hagerstown. Across US 40, it becomes South Potomac St., and MD 65. MD 60A: (no name) 0.10 mi. ; between MD 60 and MD 418. A new route in 2001, offering a new Potomac River crossing into West Virginia. It links MD 51 east of Cumberland to WV 28 and the Cumberland municipal airport which is on the West Virginia side of the river. It's only 2 lanes, wedged in tightly between the massively wide rail yard and the Potomac River. South of West Elder Street, it's divided, but only one lane each way. No trucks over 5 tons are permitted. Brown signage is used and brick on walls and bridge abutments. MD 61A: (no name) 0.14 mi. ; from MD 61/River Ave. intersection west to road end. MD 61B: River Ave. 0.08 mi. ; East from the same intersection to road end. MD 61 · was Old Forge Rd. Decommissioned 1956 (SRC Min. 10-15-1953, Effective 07-01-1956), number reassigned 2001. MD 62 · Little Antietam Rd. Does not technically reach MD 64, but the 'old' 64, now assigned unmarked MD 804B. North of Williamsport, this route was MD 398, because of the old 'no duplex' policy; 63 and 68 share a 2-mile section. Near its southern end in Sharpsburg, Route 65 passes near Antietam National Battlefield. MD 66 · Mapleville Rd., Bradbury Ave.
12.84 mi. ; from Alt US 40, Boonsboro north to MD 64 north of Smithsburg. MD 67 · Rohrersville Rd. MD 67A: 0.00 mi.; . MD 67B: 0.00 mi.; . MD 67C: 0.00 mi.; . MD 67D: 0.00 mi.; . MD 67E: 0.00 mi.; . MD 67F: 0.00 mi.; . 81.09 mi. in Maryland; from WV line east to I-70, Hancock. MD 68 · Lappans Rd., Clear Spring Rd. I-68 has its own page in the Interstate section. MD 69 · was Jefferson Blvd. from Alt. US 40 south to Cherry Lane. No longer assigned (decommissioned 1956). Gone by 1961. Had nothing to do with sign theft, more like the Twelve Year Program. Theft of Route 69 markers in other states such as New Jersey, which changed its Route 69 to 31 to save money on replacement, was discussed in a recent misc.transport.road thread. Also mentioned was theft of route markers depicting other suspect numbers, such as various states' 420, and the infamous US 666 in Arizona and New Mexico. FYI, MD 69 was dropped before 1961, MD 420 was gone by the seventies, and MD 666 (ironically, Saint Paul St. in Kensington) was probably never signed, but also gone by the fifties. I-70 has its own page in the Interstate section. MD 70 · Roscoe Rowe Blvd. 2.32 mi. ; from Bestgate Rd. south to MD 450. Offers best entrance to Annapolis, on axis with the State Capitol. The State Archives are at the first left after MD 435; spent many a Saturday there researching for this site. It's well out of the way of I-70, so peaceful coexistence without confusion is possible. Interstate numbers don't seem to be a consideration when using or changing Maryland route numbers as is the case in other states. Rowe Blvd was completed by 1955; though the number is not shown on official maps, the old 70 was by then changed to 464. MD 70 · was Knoxville Rd. No longer assigned, route is now MD 478. The 70 number was already switched to 478 to make way for Rowe Blvd sometime between 1949 and 1953, too early for the change to be for I-70; the Interstate Highway legislation wasn't passed till 1956. No longer assigned (decommissioned c. 1960), now part of US 301. MD 71 on the Upper Eastern Shore, 1958. 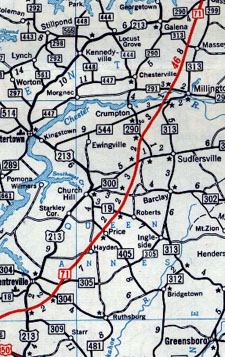 US 50 / MD 71 split, from A History of Road Building in Maryland, 1957-58. Number removed when US 301 rerouted into Delaware on this highway; 71 is the only 2 digit number to be scrapped twice! However, both former 71s are not only still numbered highways, but main drags. Choice of 71 may have been an attempt to match numbers with nearby Delaware 71 or vice-versa. No longer assigned (decommissioned c. 1958), now MD 194. Entire route now MD 194. Number 71 later given to Blue Star Mem. Hwy., now the Eastern Shore part of US 301. MD 72 · was Lewis Station Rd. MD 73 · was Yellow Springs Rd. No longer assigned (decommissioned c. 1967). A northern portion of this route survived into 1966, but gone by '68. 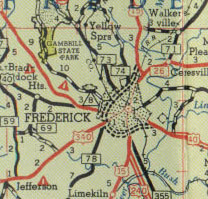 MD 73, 74, 59, 69, 71, 78 around Frederick, 1955. MD 71 became 194, 78 became 180, then 351. The rest were gone by 1970.
from US 15 north to end of state maintenance. Gone by 1961, possibly engulfed by annexation of entire route by Frederick. May also explain northern part of 73 sticking around another five years. The formerly state maintained portion has been made into a 4 lane divided suburban access road. There's no way of telling that it ever was anything other than a new road to get to new subdivisions wedged in on the edge of Fort Detrick. MD 75 · Green Valley Rd. In the Carroll County portion, from Union Bridge to the 'northern' terminus' in New Windsor, northbound traffic actually heads east-southeast! MD 76 · Motters Station Rd. Keymar MD 77 · Rocky Ridge Rd. MD 77 passes through Catoctin Mountain Park, and runs near to the presidential retreat, Camp David. No longer assigned (became part of MD 180 in early 70s, and MD 351 since 1988). MD 78 comprised all of what is now Route 351, with exception of some changes in alignment at the northern end with I-70 and US-340. It still ends in the same indeterminate place just short of Church Hill as 351 now as it did then as 78. Has been part of U-shaped 180 and now 351 since dropping of 78. Through these number changes, the route itself is mostly unchanged. MD 79 · Petersville Rd. 1.81 mi. ; from MD 17, Brunswick north to MD 180, Petersville. Awfully short for a 2-digit route.